Brian stared glumly out across the rows of stalls and table tops. As far as he could see, white vans were lined up behind trestle tables, the rear doors flung open as more and more objects were disgorged from inside. A throng of anoraks and beanies shuffled between the tables, moving slowly like a defeated army. The stall holders warmed their hands on thermos cups or sat rigidly on camping chairs, cocooned in blankets, as if lying in wait for unsuspecting prey. Either that or they were frozen solid. Brian had never seen so much stuff. After ten minutes of browsing, his mind was overloaded, refusing acknowledge anything in particular. It was all just one mass of crockery and jewellery, knick-knacks and ornaments. He knew he was supposed to be looking for something of value, a hidden gem, but really, where was one supposed to begin? It was as if he had lapsed back into a pre-linguistic phase, unable to differentiate between objects. His thoughts locked into a revolving mantra – look at this, look at this – broken at intervals by a despairing, puzzled query: who on earth was going to buy this? In desperation, he latched on to a teacup, turning it delicately in his fingertips like he’d observed the so-called expert do, peering at its base in search of a sign, any sign, that might tell him that this was anything more than he feared it was: a cup. Made in China. Brian replaced the cup on the table with a sigh. Another drip of disappointment plopped into his puddle of gloom. It was his own stupid fault, he knew, for agreeing to come on this progam in the first place, but his mother was keen, excited even, and, at the time, it had seemed like a bit of harmless fun. It didn’t seem like fun now. Brian shuffled morosely after his mother who, in turn, was being guided by the so-called expert whose job it was to navigate them through the warren of stalls and advise them on possible purchases. They were the blue team and, today, their challenge was to purchase three items which, at a later date, might possibly fetch more at auction than the items bought by their opponents, the red team. There was no time for reminiscing now though. Already the blue team had used up half its allotted buying time with nothing to show for its efforts. Brian could feel the pressure of expectations start to build. Every time he paused near a stall in the hope of finding a suitable object, the accompanying camera crew nosed in a little closer, the sound boom hovering over his head. This is what it must be like to be a celebrity, thought Brian, except that celebrities aren’t forced to wear oversized blue fleece jackets. “Anything catch your eye, Brian?” The so-called expert who, up until that point, had devoted most of his attention to Brian’s mother, was trying to jolly him along. Brian sensed though that even the so-called expert knew he was a lost cause. Brian turned desperately towards the nearest stall where the first thing he saw was a row of black box-like objects lined up like portaloos. They looked as if they might have been used once upon a time for storing something but what that might be Brian had no idea. “What about these things? What are they for?” he asked, pointing towards the black objects. 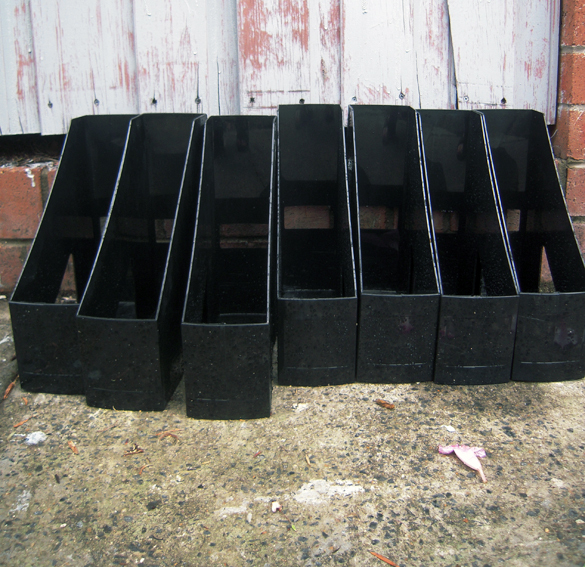 Magazine holders. “Oh yes,” said Brian brightly, not having the slightest notion what the so-called expert was talking about. The so-called expert held his hand vertically inside the container to demonstrate how a magazine might be stored inside its holder. “Worth anything?” asked Brian hopefully. The so-called expert turned back to Brian’s mother who was holding up a salad spinner. Instantly the camera crew swung towards her. Brian stared ruefully at the magazine holders, once so useful but now utterly redundant. Unwanted and unloved.